Outside Comics & Geek Boutique, with artist Stasia Burrington, are currently raising funds on Kickstarter to produce the Deck of Many Things. The 22-card deck may be used as a mini tarot deck, a number generator, a storytelling aid, and more. Tier options include the deck with box and booklet, prints, and enamel pin, and t-shirts. The Kickstarter ends on November 26. Zhou Fang is currently raising funds on Kickstarter to reprint Garden – A Graphic Novel. Schoolgirl Penn lives in a sleepy town with her friend Shazia, but as the apocalypse creeps into her life, will she find the strength and courage to do something – and will it matter? Tier options include digital and physical copies of Garden, prints, an inktober collection of artwork, and an original commission. The Kickstarter ends on November 29. Are you an artist, writer, or independent creator with an online store? 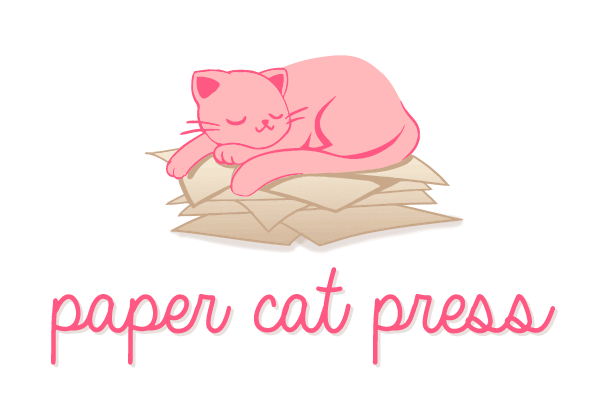 Sign up to be listed on the Paper Cat Press 2018 Holiday Gift Guide. Want to receive an email when the list goes live? Sign up here! Sign up by November 18 to be included! Do you sell commissions? You can be part of the Holiday Gift Guide, too. Sign up here with your commissions information. Sign up by November 18 to be included! (London, UK) Blue-Zoo Animation is seeking a 2D Background Painter, a 2D FX Artist, a 2D Layout Artist, CG Generalists, CG Modelers and Texture Artists, a Character Designer, a Lighting TD/Compositor, a Maya character animator, a Rigger, a Storyboard Artist, a Toon Boom Harmony Animator, and Speculative Script Writers! (Vancouver, BC) DHX has job openings for a 2D AFX Artist, a 2D FX Artist, a 2D Harmony Compositor, 2D Storyboard Artist, a 3D FX Artist, a Lead 3D Designer, a 3D Lighting Artist, a 3D Senior Designer, a Senior 3D Modeler, a 3D Modeler, a Senior Previs Artist, and more. (Burbank, CA) Disney Television Animation is hiring a Production Associate and a Storyboard Revisionist. Be sure to check Disney’s website for both creative and office positions with Disney! (Glendale, CA) Dreamworks is hiring an Animation TA, an Art Director, an Assistant Animatic Editor, a CFX Artist, a Character Designer, a Feature Editor, a Feature Production Coordinator, a Feature Technical Director, a Supervising Director, a Surfacer, a Visual Development Artist, and more. (Burbank, CA) Nickelodeon is hiring a CG Generalist, a Character Designer, a Color Stylist, a Production Assistant, Senior Art Director, and Storyboard Artist. The 2019 Redbubble Residency is now accepting applications through November 23. Pitch a project that you could work on for 6 months in either San Francisco, CA or Melbourne, Australia. Relocation and living costs are not covered, but residents do receive $3,000/month. Light Grey Art Lab is hosting a holiday art swap. Sign up by November 27 to be included! Kickstarter Comics Outreach Lead Camilla Zhang is hosting a free webinar about running a successful Kickstarter campaign on November 29. Andres Salazar is look for an artist/penciller. Anime Expo (July 4-7, 2019) will have its Cyber Monday sale on tickets starting 12PM PST on November 26. (Seattle, WA) Fantagraphics is hiring a Production Manager. The Asian America Writers’ Workshop is seeking contributions to its upcoming anthology A WORLD WITHOUT CAGES discussing life in prisons, jails, and immigrant detention. Essays, nonfiction, fiction, poetry, and visual storytelling are welcome through today, November 16. Acceptable submissions are not limited to Asian-Americans. HarperCollins Childrens Books’ Diverse Voices Open Inbox is accepting middle grade manuscripts reflecting a diverse background or #ownvoices through today, November 16. A grand prize winner will receive editorial feedback and may be considered for publication. Ninestar Press is seeking LGBTQA+ romance fiction and genre fiction novels with the theme of “Deal with the Devil” through November 30. They also have an open call for LGBTQA+ paranormal, sci-fi, fantasy, and horror. Carina Press has an open proposal call until December 3. A full manuscript is not required in order to submit. They also have an ongoing open call for male/male romantic suspense. (Burbank, CA) [adult swim] is seeking a Development Intern. (Burbank, CA) Cartoon Network is seeking Production Interns for Spring 2019. Mari shared these great visuals to show how ambient light affects coloring! ZapCreatives is offering 15% off custom shaped stickers with code “sticky” through November 20. Book Riot has frequent book giveaways. They’re also giving away a $250 gift card to Barnes and Noble through November 30 and a $250 gift card to Powell’s through December 31. Goodreads constantly offers giveaways for a variety of titles in all genres. Check out these giveaways for comics and graphic novels, like this one for Good Talk by Mira Jacob.